Since the first panel, I’ve continued to attend their events regardless of the topic because I always find it interesting. The point is to find the intersection between technology and another industry. The topics have ranged from Film, Gaming and Education and they always put out a good spread. It is thanks to their events that I was introduced to Rightsleeve and their wonderful services. Their latest one was HealthConnect (#HCTO) where the discussion was centred around health. Amazing discussions come out of their panels and it is never boring! I can’t wait to see what the 2013 season brings. Both Karim and Carolyn have been extremely supportive of me in my endeavours and have welcomed me with open arms. It is thanks to Carolyn that I began learning about WordPress just over a year ago. Had it not been for her insight and suggestions, I would not be where I am today. To give you an idea, I presented at WordCamp Toronto 2012 last month with a success story. They don’t just limit themselves to their own business either! You can find them almost everywhere, including Venus Ventures and Lean Startups. Heck, they were event at TEDxToronto today! Please give them all a follow on this wonderful Friday and I hope to see you at the next one. The Retro Road Show is put on by Nth Degree Entertainment headed by DJ Thomas Hall. For those of you that went to The Joker on a regular basis in Toronto, you might remember him. Think of those video dance parties that your high school would put on from Much Music with the videos projected all over the walls with Retro Music from the 80’s (and now the 90’s) and throw in the alcohol. 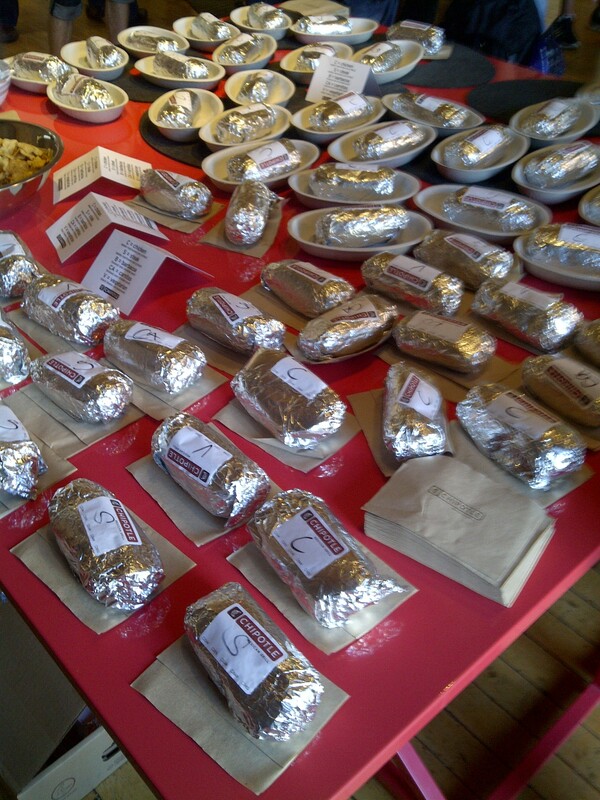 NOW you’ve got one hell of a party. They also do private and corporate parties and I’ve attended at least one wedding where they DJ’ed and they never disappoint. I’m sorry that I missed them during Scotiabank’s Nuit Blanche last month, but they were at King & Bay all night and I’m sure were a great success. I started going to the Retro Road Show about three years ago because a friend of mine from high school said it would be a blast. She’d been going for some time and invited me along. I had a blast! I’d told my brother about it, but I wanted to check it out before I brought him along. As some of you might know, my brother is Autistic and it’s difficult to find places where he feels comfortable and that are safe for him. IT WAS AWESOME! The next time I went was New Year’s. I’d tried to find a place that my brother could go where we didn’t have to deal with the potential for violence (as is prone on such evenings) and where he would feel accepted. 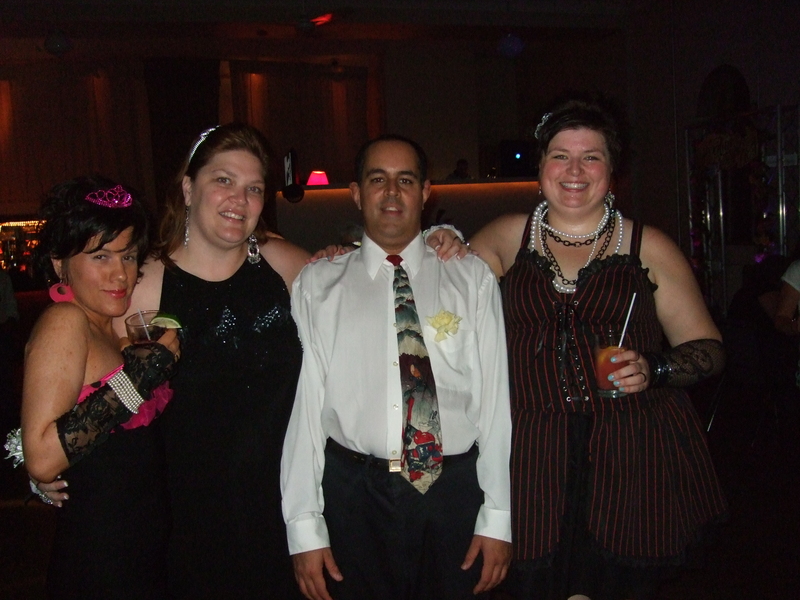 This was the first time my brother was able to go to a “club” and go out dancing on New Year’s Eve. We’ve been going ever since. I feel completely comfortable with my brother going even without me because I know that there are people there that know him, welcome him and will protect him if something goes wrong. My brother never went to his prom, but thanks to the Retro Road Show, he got it. It truly is an amazing feeling to find a place where he is welcomed. Our friends and I have a great time every month and I make it a point to go whenever I can. I think I’ve missed five in the last three years and make it out for their Hallowe’een and New Year’s Parties every time. Tonight, we celebrate my brother’s birthday as well as DJ Thomas Hall’s at their new release, Retro Wave Fridays at the Dovercourt House at 9:30 p.m. The usual one is held the third Saturday of every month in the main floor space, except for October and December when they have their extra special events! You will have a dose of Retro every month to keep you going. HIGHLY RECOMMENDED! This group of people put on a great show, but also have my undying thanks for having an inclusive atmosphere, safe and fun for all. Make sure you follow DJ Thomas Hall, Nth Degree Entertainment and Retro Road Show on Twitter, as well as join their Facebook Groups/Pages for chances to win tickets. Tune in on Friday afternoon to listen to Superstar DJ Thomas Hall on Boom 97.3 with their Retro Mix at 5 p.m.
Ravi and DJ Thomas Hall – The Terrible Twosome. 😉 Thanks to Diane for this photo. Jon Gauthier and I meet at some pretty cool events. Sometimes, like last week, I get invited to some really awesome stuff because he’s on the list. He’s selfless in his invitations and is great company. He passed along an invitation for the Centre For Social Innovation‘s Grand Opening in Regent Parkand I took my brother along. It was a wonderful event and an amazing vibe throughout the room. Makes me want to know more about the organization and inspires me to do more. Afterwards, Spacing was having their Fall Party and invited I and my friend along. 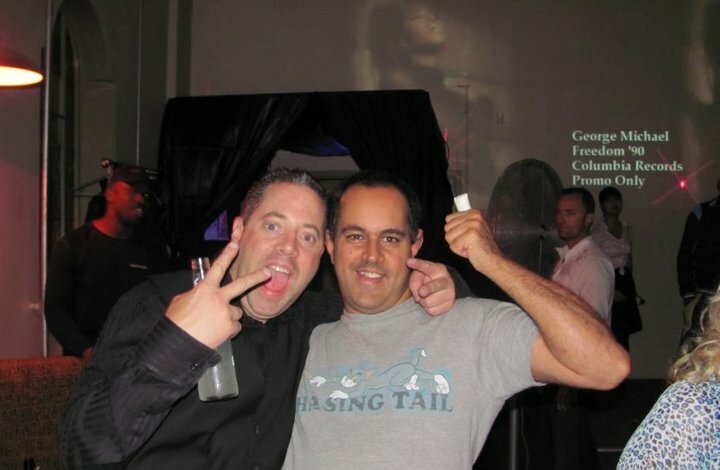 We had a great time and I even got my photo taken with one of my Twitter idols, Shawn Micallef. When he’s not being the social butterfly, he’s the co-founder of Good Foot Delivery Service, a messenger service that hires people with disabilities. My brother worked in a mail room at one time, so needless to say, this is a great social/business model that helps people who would not otherwise have a job earn a living. I highly recommend today that you get on to Twitter and follow Jon Gauthier, who gives of his time and energy if nothing else for the good of those around him. As usual, RightSleeve has outdone themselves. I was once again invited to their Swag 2.0 event in May. I went last year and had a great time. This year was no exception. For those that don’t know, Rightsleeve is a promotions company that has clients large and small, but all feel important. Last year’s event had more exhibits and suppliers, but this year I did a lot more networking. I’d been out of touch with everyone for a while, and this was a great chance to catch up. Either way, it’s a great event. 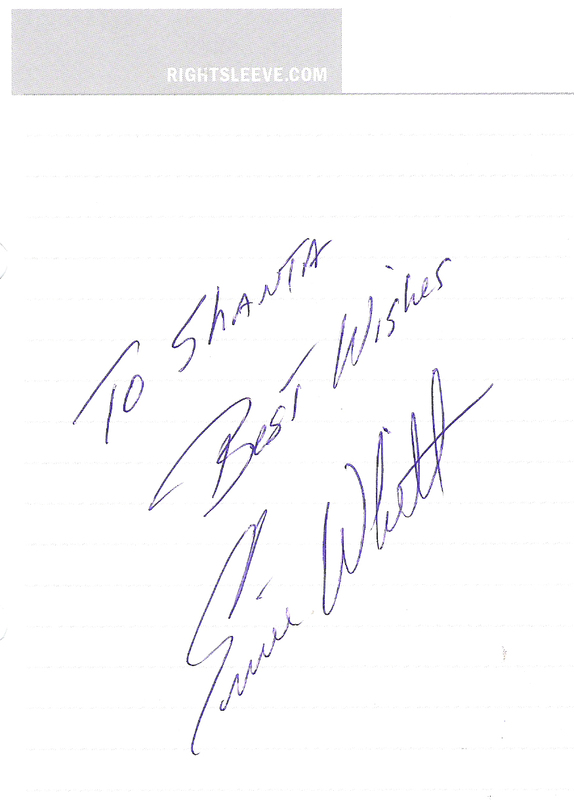 Last year, I even met Ernie Whitt, former catcher for the Toronto Blue Jays and got his autograph! Karim Kanji is still jealous to this day. I’m not only impressed with the products they have (and give out!) but with how friendly and supportive they are. They do a lot of promo for many worthwhile events around town, including Third Ocean‘s XConnect panel discussions, which I try never to miss. When I was working on getting my consulting gig off the ground, I got an invite from Mark Graham to attend. I was in no position to spend money with them, but he didn’t care. Their events are a great chance to network and are definitely fun to attend. Mark wanted to help out and knew that I’d probably spread the work of their good deeds. Well, it obviously worked and I’ve never forgotten his kindness. Every chance I get, I put their name forward and know they won’t disappoint. So please make sure that you add Rightsleeve to your feed and let them know if you have any promotional swag needs. They are definitely the best in everything they do. 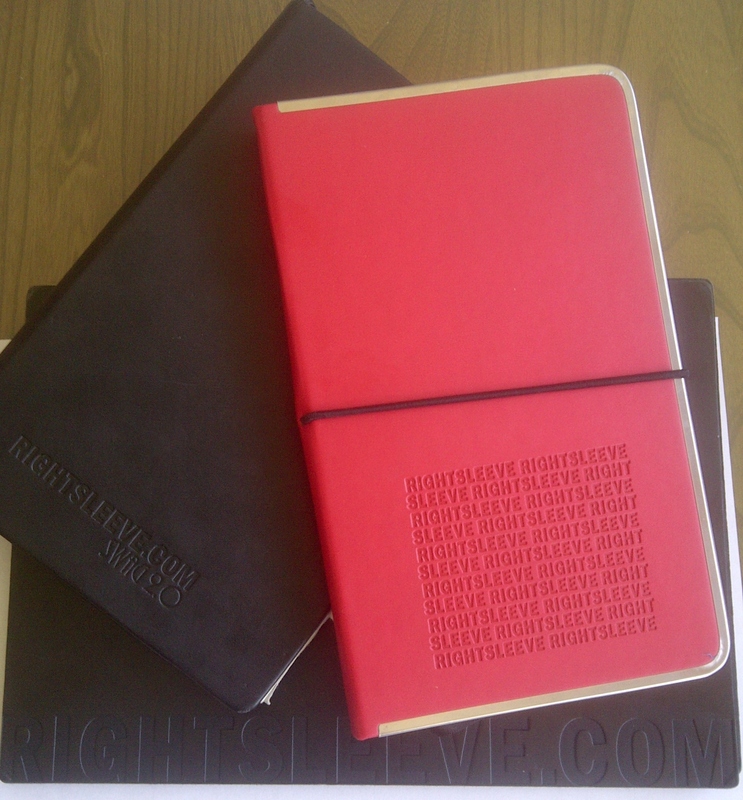 No Rightsleeve collection is complete without their notebooks. Two black ones used. Started the red one on Labour Day. 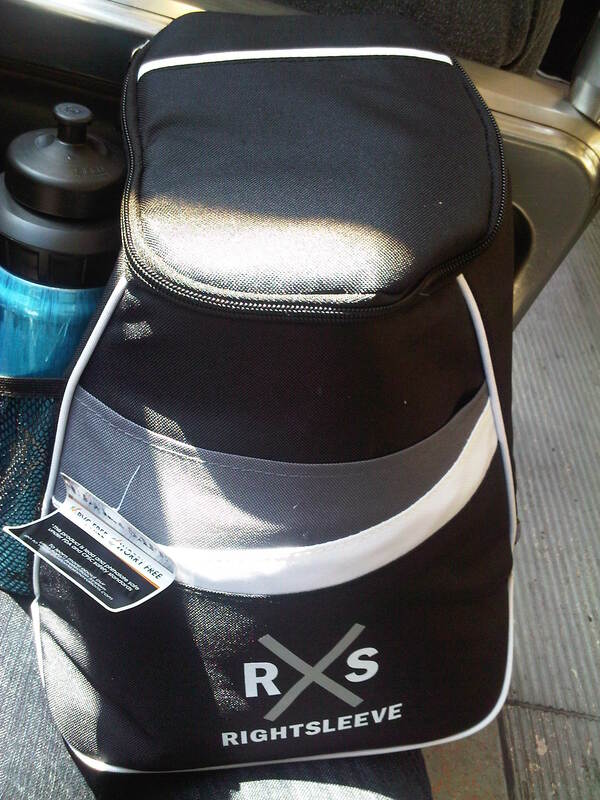 Rightsleeve Cooler Bag and Water Bottle perfect for a day outing. 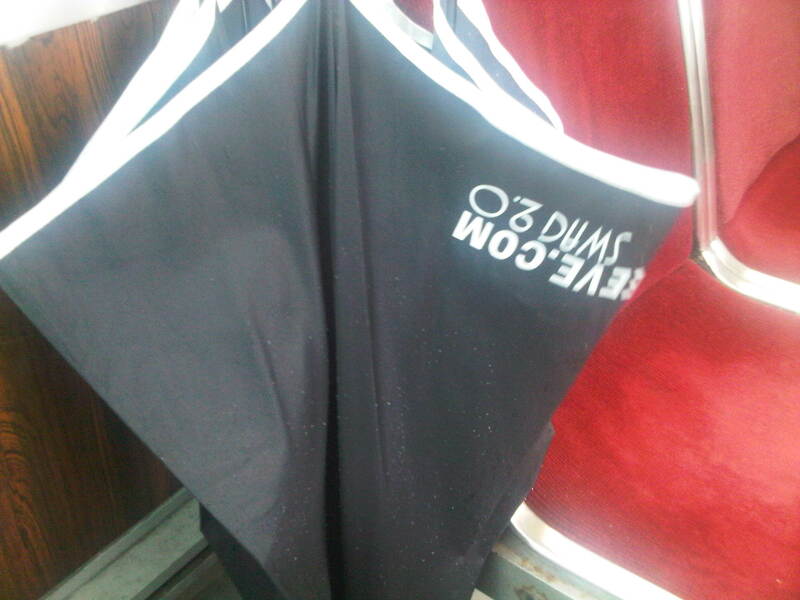 They gave these out the first year I went and it is my favourite umbrella. Talk about building a community from the ground up! DevTO is certainly a great example for how to do it right. 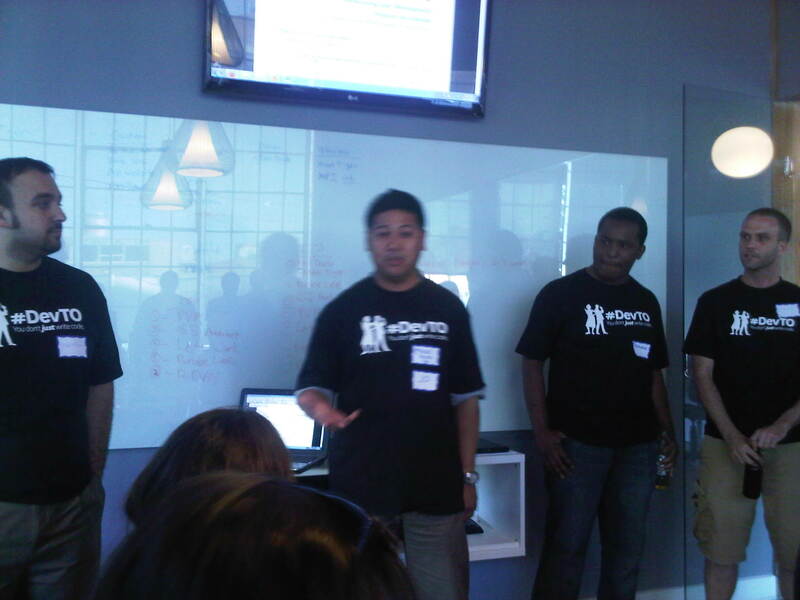 I attended my first DevTO just over a year ago at Richmond Day, which was their second event. 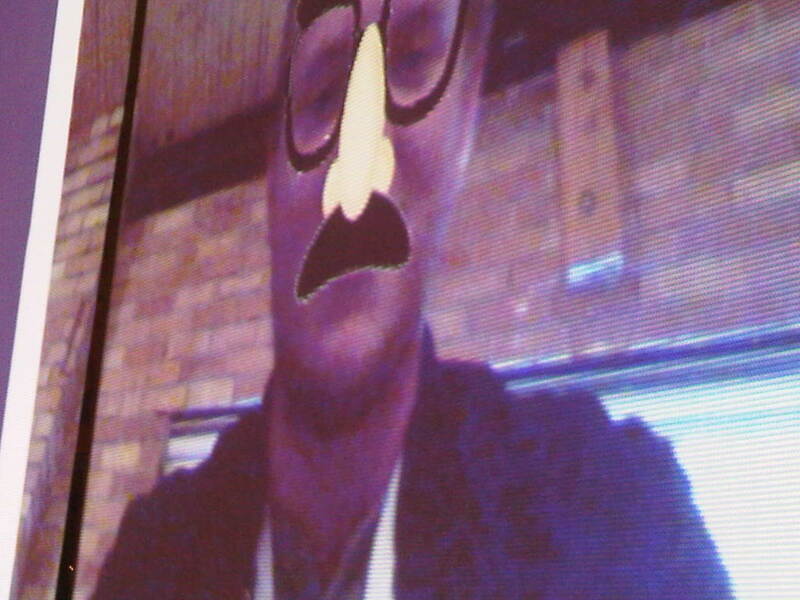 I am on record as being the first female techie to attend apparently. There were about six of us, sitting around a computer where we were being shown by Chris Brooker how Epilogger was created. I’d seen it in action a few days earlier and was familiar with it, but it was great to hear the in depth development of the project. I had also just started learning WordPress, so I brought my first site to them in hopes they could help me understand one or two things about a problem I was having. They gave me some great direction and I was happy to report at their next meeting that thanks to the advice I received, I was able to resolve the issue. This next meeting had over 20 attendees, including quite a few women. This event was going places! Over the coming months, they had more great presenters, including Wes Bos, Xtreme Labs and most recently, Paul Laberge of Microsoft and Sachin Monga Facebook. The venue changed from Richmond Day to the ING Café, with their One Year Anniversary held at CSI: Annex. The latest one was held at Polar Mobile. The beauty about the change in venue is that they keep getting bigger. They are making sure that they have room for everyone and are changing with the demographic. Don’t think that this is just the place for developers! Oh no, this meetup is designed to be for everyone from marketing and HR to the developers themselves. They pride themselves on bringing everyone together that has something to do with developing and puts them in the same room with beer and pizza. They have grown to have some great sponsors including Headstart Solutions with Sue Varty and Marc Roginsky, ThinkWrap and ThirdOcean with Carolyn Van and Karim Kanji. They have numerous giveaways from FITC and many other sponsors using an app developed by one of the founders, Nael called Twitter, Twitter, Chicken Dinner which picks winners based on your criteria for giveaways. Great little app that he designed after one of the other founders, Jo, brought the opportunity out. Jo hosts a lot of events and does a number of giveaways, so this was a great solution. DevTO has only been around for just over a year, but their events are now selling out (they are up to 100 attendees) within minutes of them posting the event on the first Monday of the month. The events are held on the last Monday of every month and can be accessed here on Meetup.com. 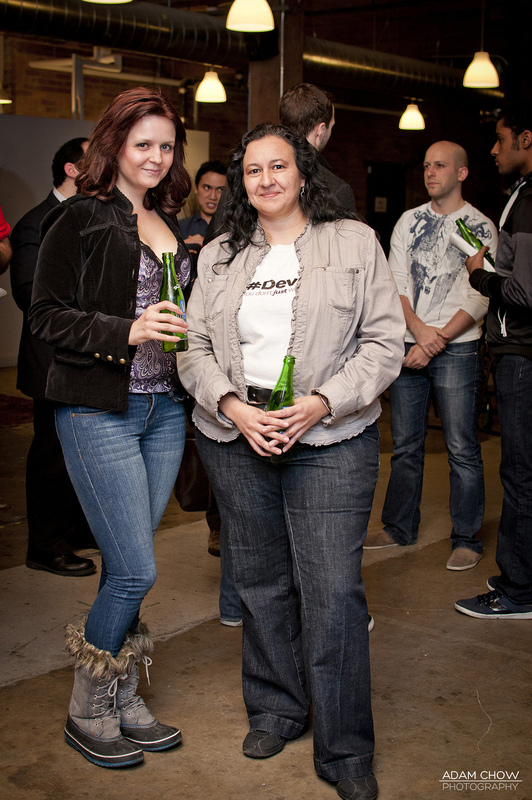 You can follow DevTO on Twitter and of course, each one of the founders is a joy to follow, so add them too (See below). Their next meetup is on Monday and I hope to see you there! Continuing my Back To School theme, I decided to take a look back a little farther than post-secondary and go back to high school. All the talk of Back To School shopping and visiting the school during the timetable pick up make me almost want to go back to high school…almost. Malvern Collegiate Institute is one of few high schools in the Beaches area of Toronto. In 2003, it celebrated its 100th anniversary and shortly thereafter the alumni association was founded: The Malvern Red And Black Society. No one or rather very few people actually knew what this organization did. Red and Black are the school colours and the Black Knights are the sports’ team names. There was usually a photo in the year book with that title, but what better way to honour a 100 year old school but with a name from within the halls itself. And so it was born. In 2004 the Charter was signed and we started to build the database of members. From the reunion, we gathered around 2,000 names and after cleaning it up and adding a few more, we are now over 3,000 members strong. Some of the members date back into the 30’s and 40’s even to this day and enjoy getting our printed newsletter, Musings (coined after the name of our yearbook, the Muse) that we put out twice a year. Malvern was a great school even if I didn’t know it at the time. I still have friends that I made at that school and they are among the closest I have. There is such a wealth of information and heritage at this school, everything from the World Wars to famous people. Some of the notable Malvernites include Norman Jewison and Down With Webster. 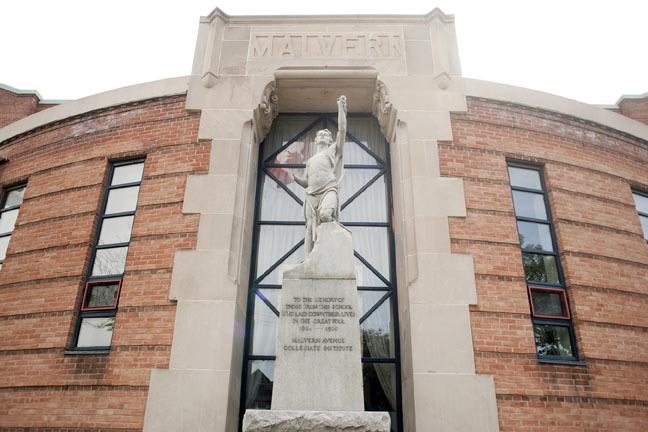 Next year, Malvern will celebrate its 110th Anniversary and the Malvern Red and Black Society is planning the next reunion. We’ve also just relaunched the new website this week! So make sure you check that out too. In the meantime, check out the Malvern Red and Black Society on Twitter for the latest updates on the reunion, Remembrance Day Ceremonies, archives and more! One of the best networks I’ve connected with since moving to Hamilton is Silicon Halton. I found them through another meetup that I attend regularly and have been very happy with not only their meetings, but with the community itself. This is a grass roots organization founded by Chris Herbert and Rick Stomphorst in 2009 dedicated to creating “a thriving community of people in technology that live and/or work in Halton region”. (Silicon Halton website) Couldn’t have stated it better myself. Though they have a pretty sturdy rule about having their members live and work in Halton, they are extremely welcoming and do not let their friendly fence get in the way of making connections. In addition to their Peer-to-Peer groups, such as SEO, Big Data and CEO, they also have an open meetup every month which anyone can attend. The format is simple yet effective: One or two presentations, meet your member which are shorter presentations done by the members of Silicon Halton to let people know what they do, and then an open floor for anyone to tell the group about anything, including events or initiatives. Last night, they had their inaugural Demo Night, so I’m sure we’ll see a post very soon to wrap that up. Their next monthly meeting is on September 11, 2012 and they are having a panel on “SMB Business Disaster Planning – What’s Realistic?” and I highly recommend attending. Silicon Halton has been very good to me and I know that there are more good things coming. You can find them on Twitter @SiliconHalton so follow along! I was introduced to this group about 8 months ago by my friend Alex Bethke. Having just started Women In Technology Hamilton, I thought it was important to find other women doing tech things, no matter where they were. Dames Making Games is dedicated to teaching women, regardless of what their professional background is, how to make their own games. They run sessions a couple of times a year and tomorrow night is the Show and Tell from the latest session, Jeuxly. They will be running this again in the winter and they call it Jamuary. Brilliant naming. So, if you’re not doing anything tomorrow night come out to their Jeuxly Show and Tell. Even if you can’t, please give Dames Making Games a Follow Friday on Twitter.